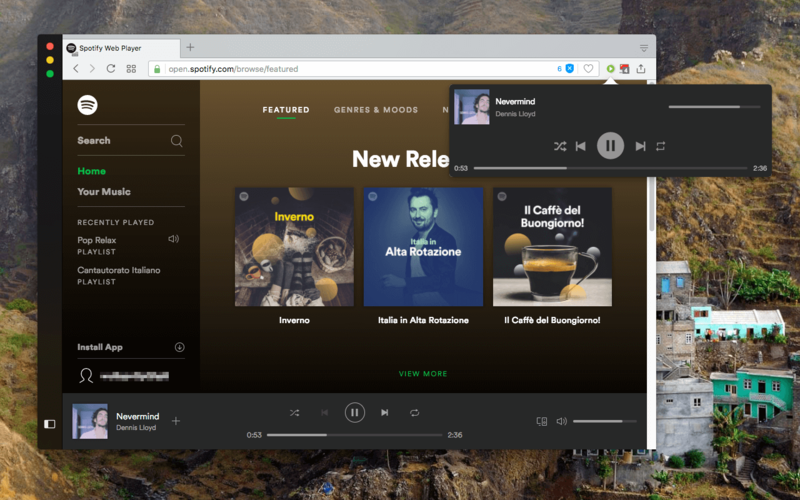 "Popup Player for Spotify™" extension aims to simplify Spotify's web player access from a toolbar popup. It simply displays all important controls that one might need when using this web application for playing music tracks. Note that the extension itself is just a controller. You need to have an https://open.spotify.com player in a browser tab and then you can control it from the toolbar popup without the need to switch to the tab to perform an action. At the moment, the extension supports play, pause, skip to the next and previous tracks and seek the progress and volume controls. You can see the track and artist names and the cover image in the popup as well. Clicking on these elements opens a browser tab that targets Spotify's page with more info about the track or the artists. What is the "Popup Player for Spotify" extension? TThis extension is meant to ease the Spotify's web player usage a bit. That's it!. The idea is to have all the important controls in a popup window instead of having to switch to the actual player's tab each time a simple action needs to be performed. For instance say you want to pause the current track for a moment while reading an important article. Without this extension, you need to find the Spotify tab among all the opened tabs first which cause a distraction. With this extension, you can simply open the popup and pause the player like it is on the active tab. This extension provides play, pause, toggle repeat, toggle shuffle, and seek both volume and progress bars. The popup also displays the name of the artists and the name of the current track. Both elements are clickable which opens the Spotify page for the targets. Note that to start working with this extension you need to have an open Spotify web player in a browser tab. If there is no Spotify web player opened, the extension offers opening one. Since Spotify does not work until a music is selected from one of the categories, you need to initiate a play from the actual UI. After that, the player is ready to take the control! How does this extension work? It basically injects a controlling script to the https://open.spotify.com web pages and monitors track changes as well as the progress and volume changes. When a change occurs and if the popup is opened, a signal is sent to update the UI. This extension does not use any resource when it is inactive (event page type extension). I have been very careful to optimize the extension to have no effect on the browser performance. Why do I need to open a Spotify web player in a browser tab? Is it possible for the extension to operate with a hidden tab perhaps? Well, this extension is only a controlling tool. It is not meant to play tracks by itself. The only purpose of this extension is to ease the access to the official Spotify's player. Since Spotify does not start a track or select a category by default, you need to initiate a track from the actual UI. When one track is selected, the extension popup window can be used to control the player.